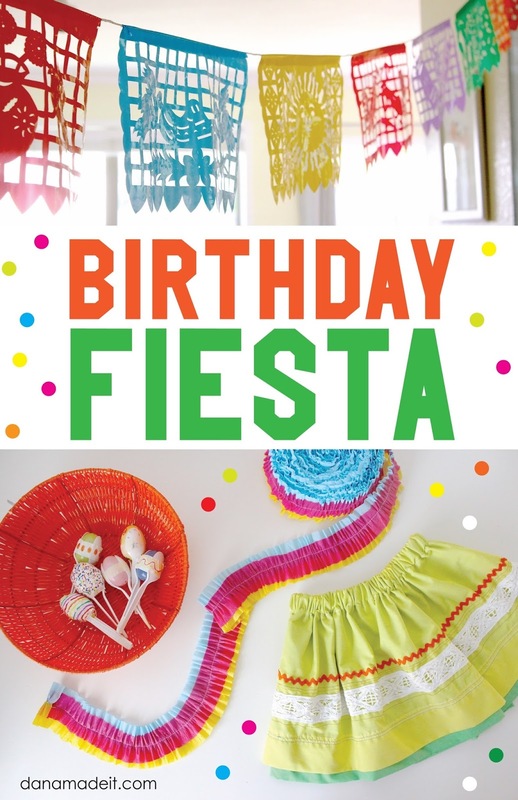 I think that a fiesta-themed fiesta might be my favorite. The decor, the food, the desire to sew 10 colorful skirts?….it’s too easy not to love! In fact, do you remember when I sewed these skirts?? They were for Lucy’s birthday party two years ago. TWO! How does time pass that quickly? The funny thing is, she’s still wearing that skirt to school (though it is getting a little short). And when I showed you these skirts two years ago, I promised to show you the rest of the celebration. So let’s get this party started! 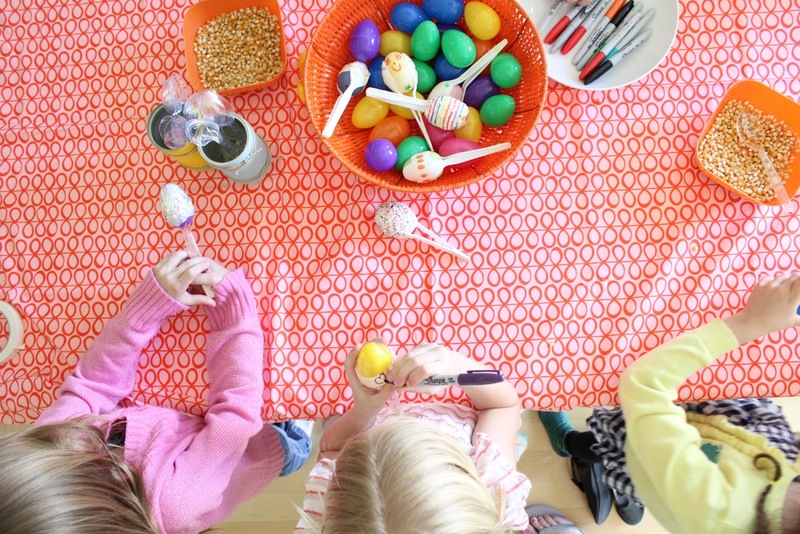 My parties are pretty simple—We usually have the party after school one day, with a few games, and a few simple decorations, a craft and a treat, and then we let the kids do what they do most—just play. We’ve had numerous parties that are little more than kids jumping on the trampoline and they’ve loved it. 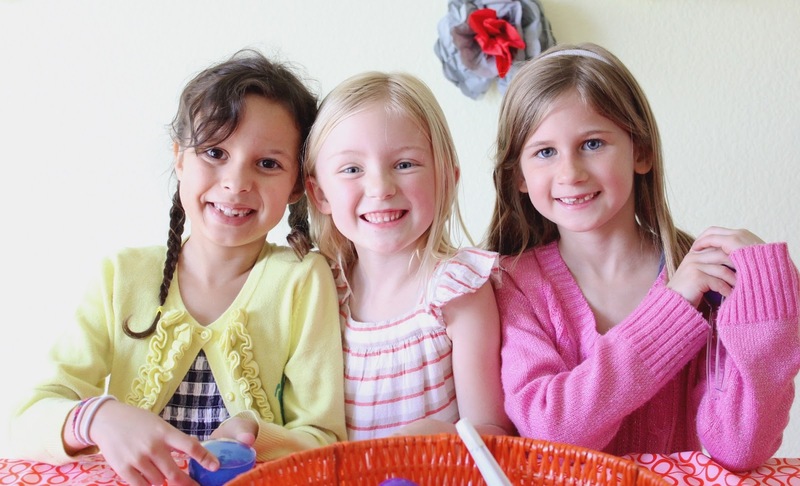 As the kids get older, we’ll do more detailed get-togethers. And in fact, this year we threw a Space Party for Lucy, where each person made their own planet and it was out-of-this-world fun! Heh heh. But back to the fiesta. And we threw it together with some store-bought items. And then by keeping the party simple, I felt like I could splurge on making one homemade item for the kids—without feeling overwhelmed. 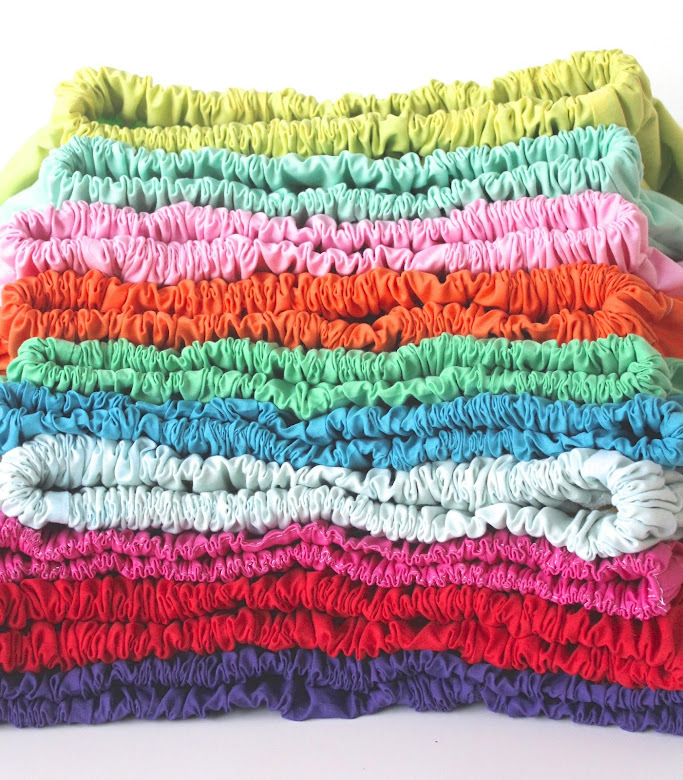 I knew I wanted to make each girl a bright colorful skirt, with lots of gathers and fabric. I may have had as much fun putting these color combos together as they did wearing them. 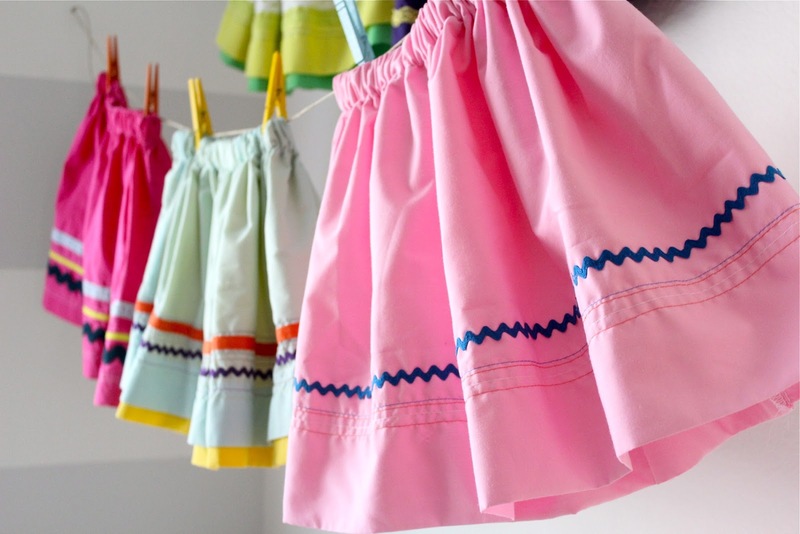 You can read all the step-by-step instructions in the Fiesta Skirt tutorial. And what made the skirts extra fun was how we gave them to the girls….we stuffed them in the pinata! 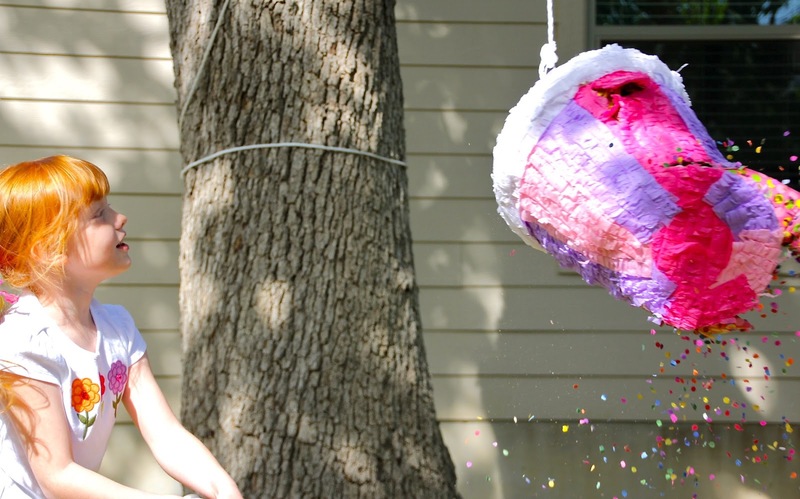 Because who doesn’t love a good pinata swing with a bat? 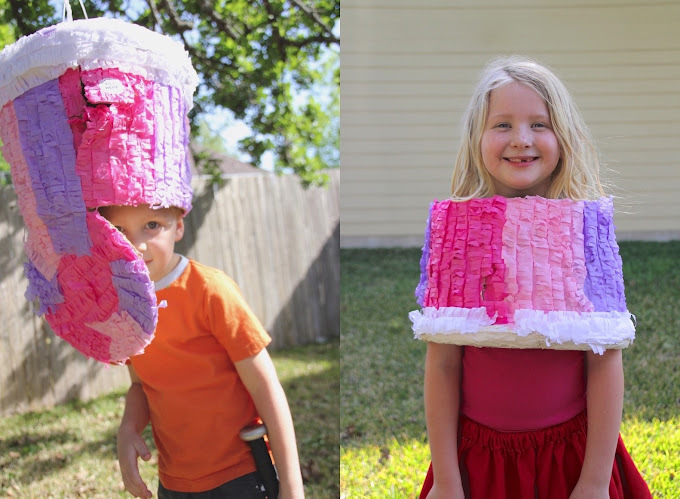 I wrapped each skirt in a roll so they’d fit inside the small opening of the pinata. 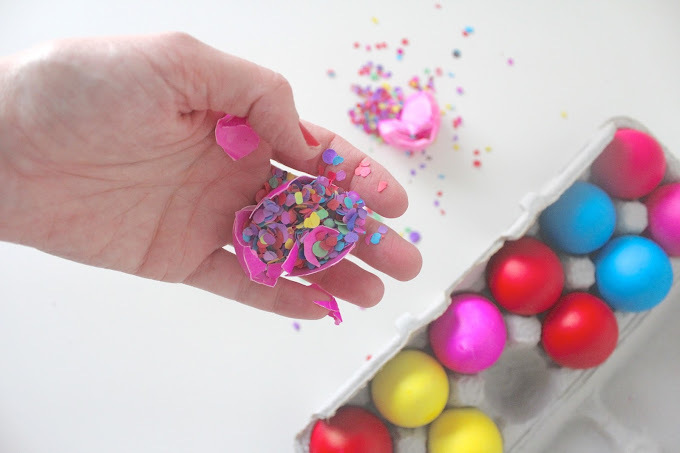 Then I threw in some loose confetti, and that was it! The kids were confused for a moment when zero candy flew out, but that was all part of the fun. And Owen was part of the fun too….poor guy, always surrounded by girls. What I hadn’t considered was that the skirts sort of padded the pinata inside, filling up the entire inside, which made it harder to break the outer shell. But finally they broke through and the confetti went flying! It was really cute! 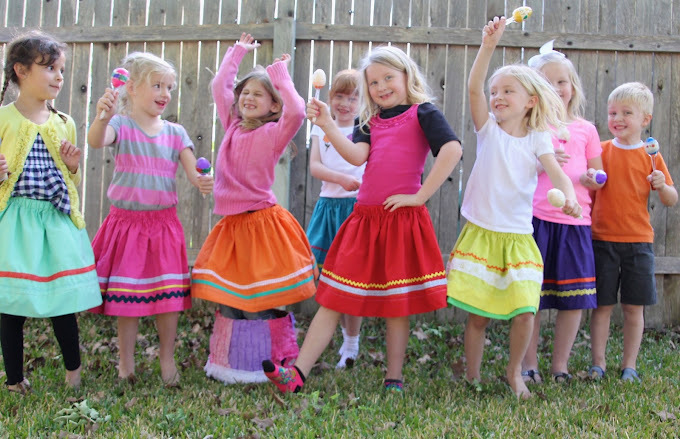 As cute as these girls in their new fiesta skirts. 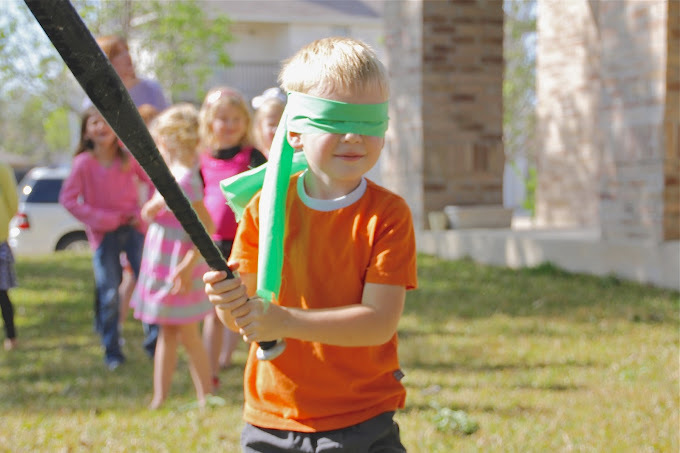 And as fun as an empty pinata, apparently. 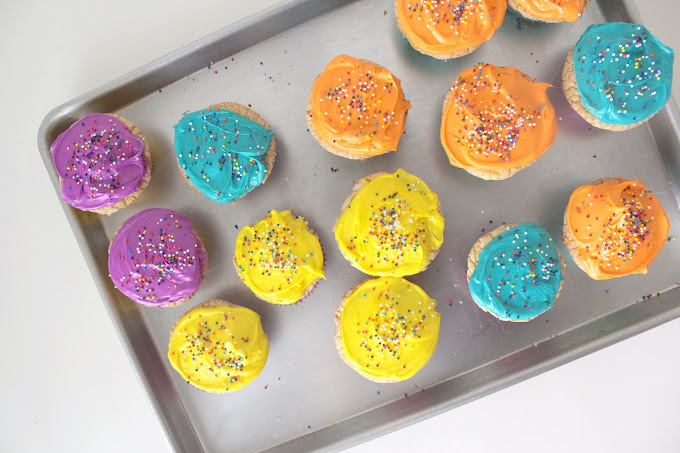 We finished off the party with crazy-colored cupcakes, with a candle on top for each kid. That’s my new favorite thing–let everyone enjoy the birthday wishes and blowing out candles. And that was a party wrap! I may have left the decor up long after the guests were gone, because it just made me happy. 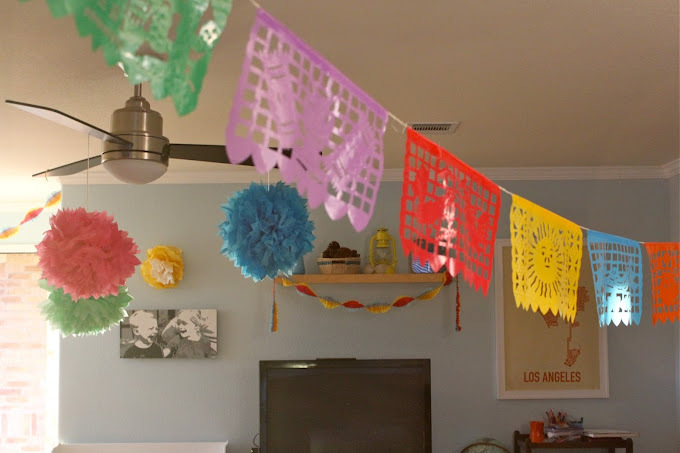 Let’s have a fiesta any time of the year…. Cute! We’re doing skirt favors for my daughter’s party this year! Awesome! 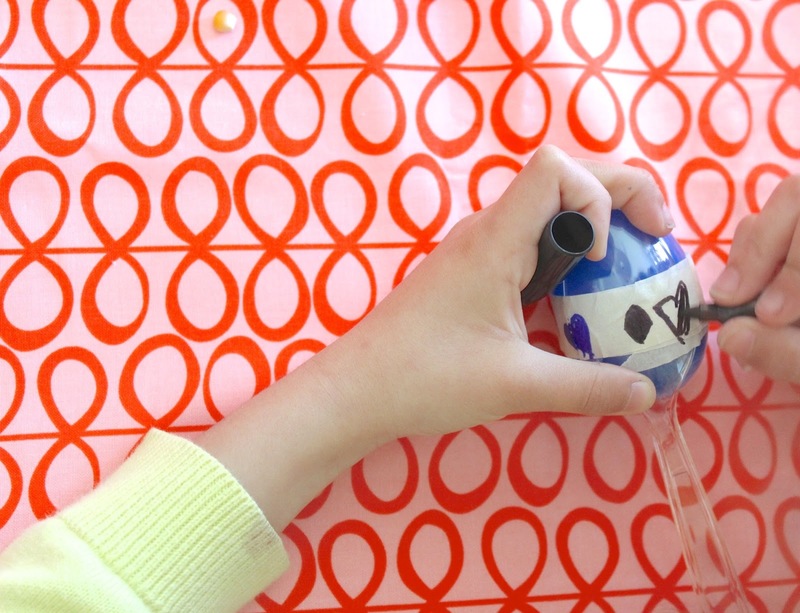 It’s such an easy and fun favor, that keeps giving all year long! aw!!! Looove the bright colors and the skirts are just a super awesome gift. They’ll get worn a ton I know! 🙂 happy bday to Lucy! Dana – as usual, you rock the party and creativity world!! 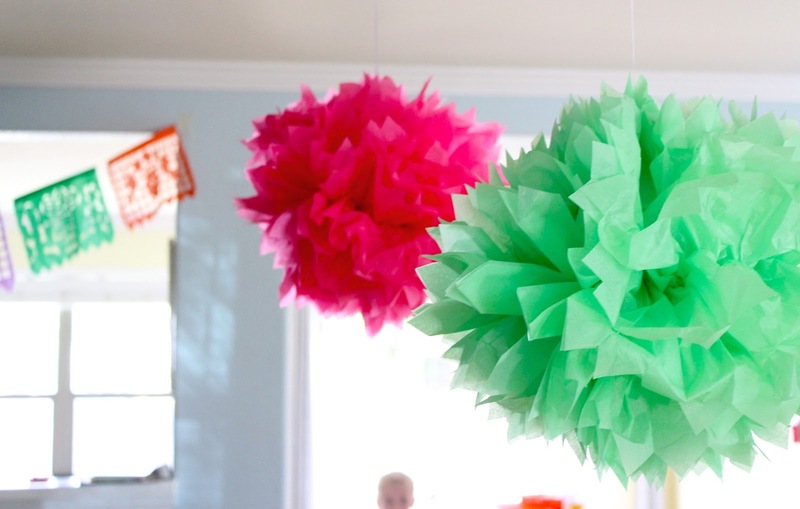 What a GREAT idea for stuffing a piñata! Love it!! Thanks for sharing your ideas. Have a great day! 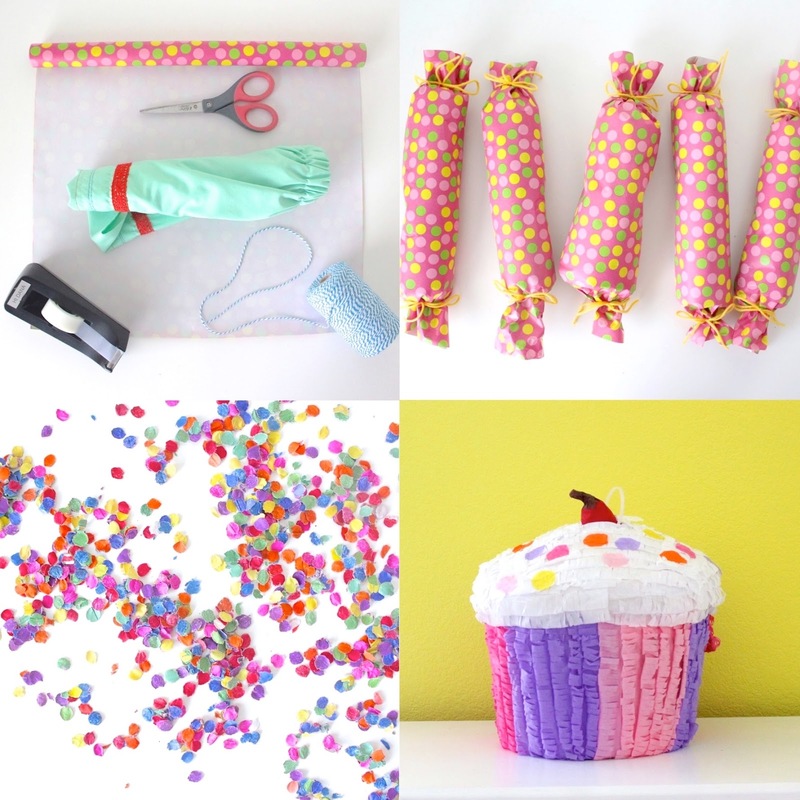 I just love all these ideas!!! This is a very cute idea! I’d love to do something like this but my daughter is friends with just as many boys as girls and our parties are mixed. It’s so hard to come up with a boy equivalent to party favors like handmade hair clips and skirts. 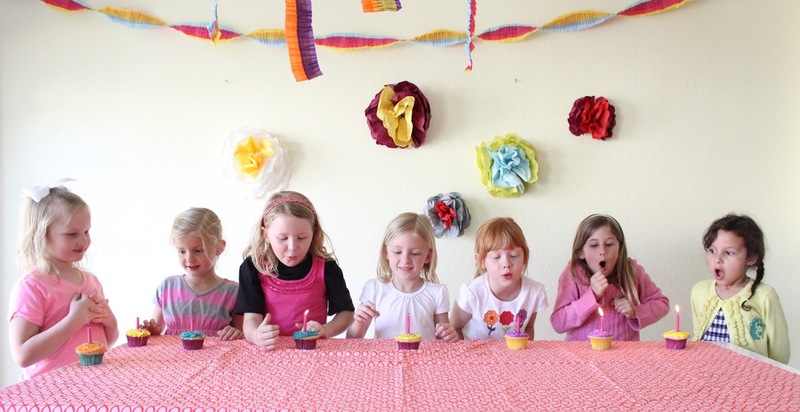 I love this – such a sweet and simple party. 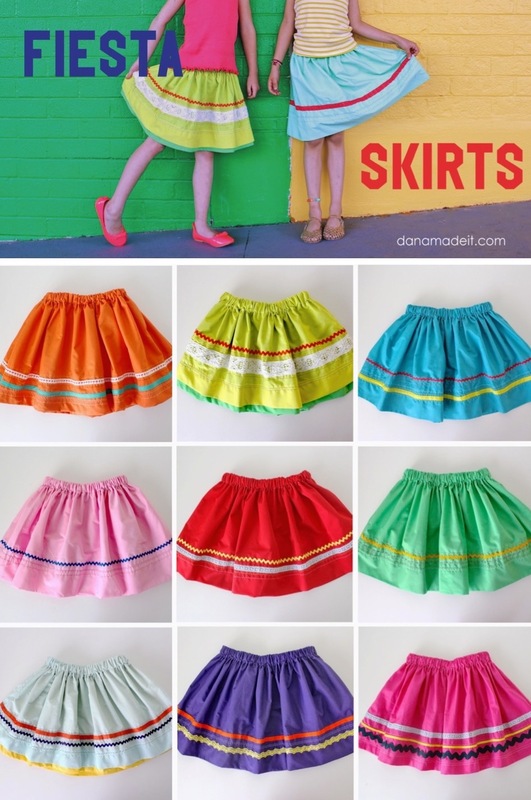 I have never seen anyone give skirts for favors, but I absolutely love it!! I adore all of your ideas – you are really fantastic. Thanks for sharing! i love the idea of EVERYONE getting to blow out a candle! Makes for happier kids, and more birthday wishes. I may just have to borrow that idea. 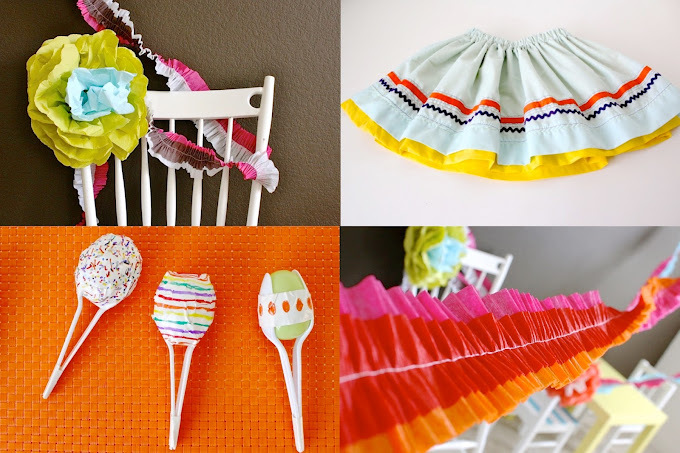 Love the idea of skirts for party favors. I may have to do something like that when my daughter wants a girls only party! Thanks for the great inspiration! 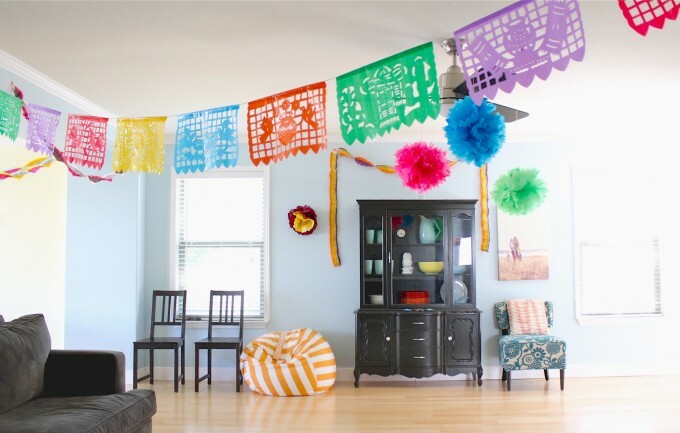 We are having a fiesta at church and I am using more than one of your ideas. Love the simplicity and the bright, cheerful colors! I love the way you keep things so minimalistic, yet so beautiful!